The lens system classification divides the microscope into simple or compound microscopes. A simple microscope consists of a single lens or several lenses grouped in one unit and are only used to enlarge an object. The lens system ranges from double convex to two plano-convex lenses. Examples of simple microscopes include reading glasses, jewelry eyepieces, and pocket magnifiers. A compound microscope includes an eyepiece and one or more objectives where the eyepiece enlarges the resolved image created by the objective. There are a series of different types of lens within the optic tube. Resolved images actually enlarge and add detail to the observed object. 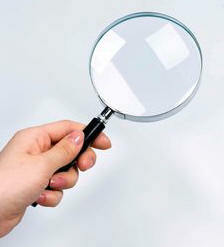 There are two types of compound microscopes that use light to observe transparent (or translucent) and opaque objects. An opaque object requires light that reflects from the object through the lenses in the optic tube. This type of microscope is referred to as a "dissecting" or “reflecting" microscope. Under a compound microscope these onion cells can see more details (resolution).